HEARTS will change their gameplan for next week’s European tie against Birkirkara to cope with Malta’s searing 35-degree heat. Head coach Robbie Neilson has already decided an intense high-pressing approach isn’t an option and will tailor his tactics accordingly. His players’ hustling and energy unsettled FC Infonet in Tallinn in midweek as Hearts won 4-2. The result took them through to the Europa League second qualifying round on a 6-3 aggregate. However, Neilson is adamant players must conserve strength in Malta after studying footage of Birkirkara matches. Dealing with the blistering heat will be one of Hearts’ biggest challenges. “The way we played in Estonia pleased me but it’s going to be a totally different game in Malta,” Neilson told the Evening News. “It’s 35 degrees over there and the way they play football is so low-tempo. You can’t go and press the opposition the way we pressed over in Tallinn. Physically, you just can’t do it. UEFA have confirmed that the first leg against Birkirkara will take place at the Hibernians Stadium in Paola this Thursday, July 14. Kick-off time is 8.30pm (7.30pm UK time). 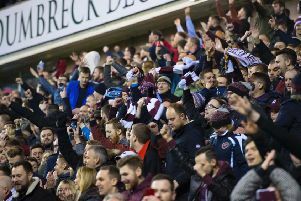 The second leg at Tynecastle is the following Thursday, July 21, with an 8pm kick-off. Hearts face Dunfermline at East End Park this afternoon in a friendly. The fixture is designed to give match practice to players who did not play much in the two Europa League ties against Infonet. Neilson explained that some of those in question will have a chance of forcing their way into the team to face Birkirkara. “They will all play today so we’ll have a decent team out. We need a big squad and we need everyone ready so it’s important they are all fit and playing,” he said. “We’ve got a league campaign coming up as well. These guys need to be ready, whether it’s a European game or a whether it’s a league game.